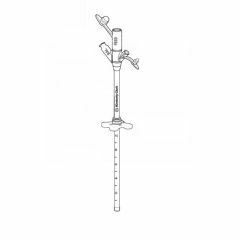 Download C14111 HALYARD G Feeding Tube Product Sell Sheet.pdf. The new KIMBERLY-CLARK® Gastrostomy Feeding Tube is designed to deliver optimal performance and value. Color-coded balloon port according to catheter French size for ease of identification. These tubes come in 9 1/2" length. It was a great tube as far as easy insertion, but we had a very hard time keeping the syringe tip in. The tube contains internal ridges that pushed the syringe tip out. I purchase this product and send it to the Philippines for my nephew who had a near drowning accident when he was 9. It's great that Allegro offers discounts plus free shipping. My supplier could only get me a brand that was white and we couldn't see through the tube. I like these because they are sturdy, you can see what's going down and if his meds get stuck, it's easy to get them out. This is a great product! Is this Feeding tube made of silicone? I currently use Foley Catheter because it's not costly even I change tube every month but gastric fluid leak discomfort me so often. Does it have a guarantee that using this tube will overcome the gastric fluid leakage because this really expensive for me if this will last only for at least 2months? What would be best for inflating the balloon, saline or sterile water? We use sterile water because it is much less corrosive and the balloon seems to last longer. looking for a 24 french gtube tip that is 24 french all the way out. my tube is 24 french but new tips have ribs inside that are not a true 24 french exit. this is needed for draining food that has not digested. the tip on the end of my tube is removable so i am looking for a tip that doesn't have ribs that make the inside smaller than a 24 french. do you have this? MY GRAND SON HAS A JG FEEDING TUBE AND I USE A RUBBER BAND TO KEEP THE TUBE FROM THE FEEDING PUMP IN THE J PART OF THE FEEDING TUBE BECAUSE IF I DO NOT IT COMES OUT AND I HAVE A MESS. WISH THEY WOULD HAVE A SYSTEN LIKE THE IVS HAVE WHERE THEY TWIST TOGETHER.DO OTHERS HAVE THIS SAME PROBLUM? IF SO I AM OPEN TO OTHER SULATIONS OTHER THAN USING A RUBBER BAN. Yes! Look for something called the AMT Clamp. It is designed to hold the feed set on the tube. This year, the tube connection is changing to one that twists together. Can the Gastrostomy Feeding Tube be used in place of the Mic-key Button? It is much less expensive. Yes, we did that with our son for that very reason. You can get a "G" tube for about 1/6th of the price of the MIC-key. I'm looking for a 20Fr Silicone Feeding Tube that is at least 14 inches long end-to-end. I've bought these in the past but can't find now. Can a long feeding tube be replaced by a button after the stoma is healed? The original tube was tacked to the flat piece at the stomach wall but was removed today in ER but replaced with another of the same long tube but only held in place with the balloon. Both KCA 22FR TUBES I USED THE BUMPERS WON'T MOVE. WHAT'S THE TRICK? Before inserting the feeding tube, apply a small amount of KY jel (it usually comes with the tube) on the tube and slide bumper back & forth. You are able to get a good purchase on the tube before it is inserted. This method has been working for me for years now. This always works for me. Before inserting the G-tube rub a small amount of the KY jel on the tube and then pull the bumper back & forth. Before it is inserted you are able to get a real good hold on the tube and pull the bumper loose. I had the same problem. It's easier to move before you put it in the patient because it required some force. Once it's in you can't pull like that. I just kept tugging & eventually it gave way. Maybe a little oil or soap would help loosen it. But better do it before inserting. Once in you'll never be able to move it. Answered on Mar 25, 2014 2:09:24 PM by Tea drinker from Cherry hill N. J. The G tube extension we use turns brown and becomes very hard within 2-3 weeks. I wonder if it's the fish oil we use 4x daily or the Reglan? The previous answer was very good. I mix the medications (sometimes they just need grinding up and mixed with the supplement, but the capsules need to be dissolved in warm water. I usually do this the night before.) The fish oil I dissolved, tried putting it through the tube, and the tube smelled awful of fish oil. I stopped the fish oil fast. But the previous answer about mixing the dissolved capsule in with the supplement might work. But the way, a smelly tube can be remedied with while distilled vinegar. I let it soak for 1/2 hour, then flush with water. There's always a solution. It is generally recommended it be changes approximately every three months. It is rare for one to continue to function properly longer than six months. Changing it every three months makes it less likely the change will have to occur on an emergency basis. My advice from my gastro is change no longer than 6 months. I've let mine run to a year and I've had a pop out as soon as 2 months. I defer to expert medical advice. My doctor's advise is, "if it ain't broke, don't fix it." That's been good for me. My tube (balloon variety) lasted 9 months. When the balloon gave out, I had a couple of tubes ready, and I'd watched a video on line about changing it. No problems. The first time is a bit nerve racking, but it's a simple thing to do, and definitely not rocket science. is this the one made of silicone? Yes it is, this one is very durable. You just have to remember, they are man made. You can get one that will last years if properly cared for, or a fluke that lasts only a few months due to a faulty balloon. I always keep one in the vehicle, & one in the house with a packet of lube, and a 10cc syringe of saline to inflate the balloon after insertion.